Providing you the best range of automatic pani puri making machine, samosa patti making machine, golgappa making machine, qualimark samosa patti making machine, qualimark pani puri making machine and semi automatic pani puri making machine with effective & timely delivery. Production Rate - Chapati 1200 Pcs. / Hr. The Pani Puri Making Machine offered by us is developed using a pioneering technology and high grade materials. The machine has adjustable thickness, lightweight and available in varied sizes. 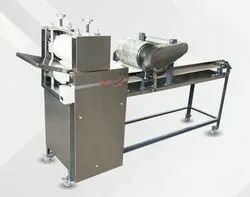 These machines are being commonly used in various food processing industries for preparation of chapatis as per the required thickness, size and diameter. 25% less LPG gas consumption compared to manual chapati making. Highly economical production due to huge savings on man power requirement and gas consumption compared to manual chapati making. Easily adjustable chapati thickness and size as per user’s requirement. Negligible noise compared to other chapati making machines. Better body insulation to reduce outer body temperature and overall heat loss. J - Type button sensor is used for precision and repeatability. Control panel with PID based temperature controller and SSR for precise temperature. Newly designed energy efficient heater and toggle switch for heater on/off. Machine structure and covers are made from S.S. to avoid rusting. Easily openable and convenient body cover. Very compact in size requires less space. Superior quality gear box and motor for maintenance and repair free operation. Heavy duty and robust mechanical structure. Easily operatable and high performance capability. Capacity 2000 Nos. / Hr. Power Consumption 0.75 Kw. / Hr. Production Rate Chapati 1200 Pcs. / Hr. The Golgappa Making Machine offered by us is developed using a pioneering technology and high grade materials. The machine has adjustable thickness, lightweight and available in varied sizes. 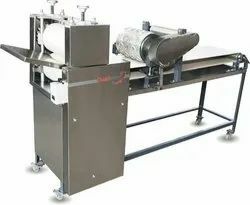 These machines are being commonly used in various food processing industries for preparation of chapatis as per the required thickness, size and diameter. It is also used to make Puri and Pani-Puri.